As I mentioned in my previous post, I'm learning that having things less than perfect is not the end of the world. Still, I am a "detail person," so if something is even a little bit off, I notice; and there are circumstances where this is not a bad thing! A few years ago, for example, I wanted to mail out a sympathy card. I was down to my last stamp, and thank goodness I looked at it before sticking in on the envelope! 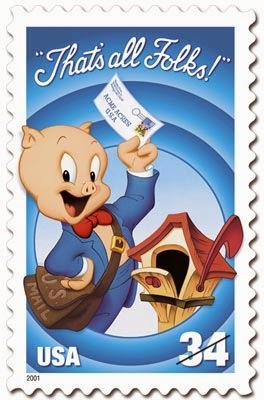 Perhaps someone less observant wouldn't even notice the stamp on the envelope, but is it worth it taking a chance that someone in need of a sympathy card would first read the message, "That's all Folks!"? So I headed into "town" to purchase some more generic-looking stamps. I use the term "town" loosely. I often joke I live in Mayberry, but in reality the place where I live in is much smaller. 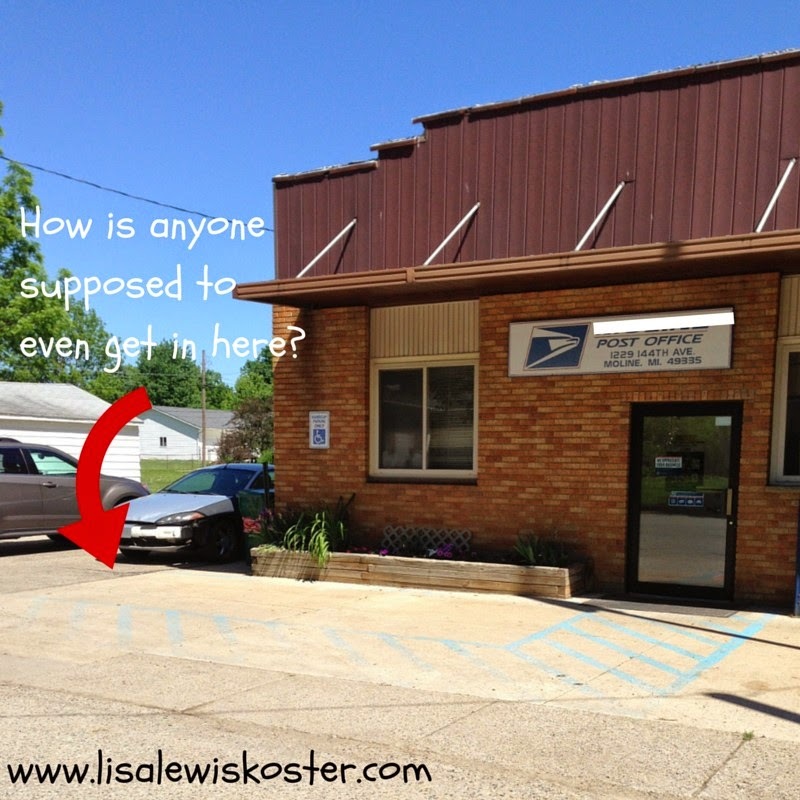 We do have a post office, which I'm very grateful for, but they don't deliver mail and it's not easy to patronize. It has only one parking spot; a handicapped accessible one which really isn't accessible to anyone. It runs parallel to the front of the building, positioned in such a way that makes it next to impossible for anyone to park there or on the little bit of driveway next to it. (Obviously they did not consult me when it came to parking!) To make the inaccessibility complete, they're only open between the hours of 10 and 2. This past Christmas we received our first card the day after Thanksgiving! Yes, evidently there are some people that on top of things. At one time, Batman stamps on my Christmas cards would have been totally unacceptable, but today I find it humorous. I mean, where else but "Mayberry" would the post office not have Christmas stamps at Christmas? No, I actually consider the Batman stamps a mark of victory! I mean really, what is a Batman stamp on a Christmas card in the scheme of all eternity? Hey, this girl is learning to cut herself some slack! Remember to carefully cut around the stamp leaving a margin. Our women's ministries used to collect stamps and send them to Springfield. They used the funds for missionary projects. Wycliffe is a worthy project too. Your batman should be very popular with those who received your cards. Thanks for sharing with us here at Tell me a Story. Cute Lisa! 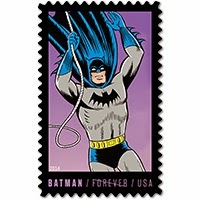 I knew there was a blog brewing about the Batman stamps! haha I love this. I too am trying to cut myself some slack. I didn't send out Christmas cards either this year and while I felt really guilty, it also brought some relief! We gotta remind ourselves we can't do it all. God bless and thanks for visiting Pretty Simple Ideas! This definitely made me smile. :-) Thanks for sharing. Visiting from Jennifer's #TellHisStory. It's a process, isn't it? Learning what's important and what is not, when to laugh and when not to cry? Because yes, there was a time I, too, would have cried over Batman stamps! Always good to relax a bit and not be too hard on yourself. Thanks for sharing your story on the Thursday Blog Hop!